This section shows you how to access and use Google Earth to check out potential striped-bass fishing spots. You can see these spots close up as they would look from space. 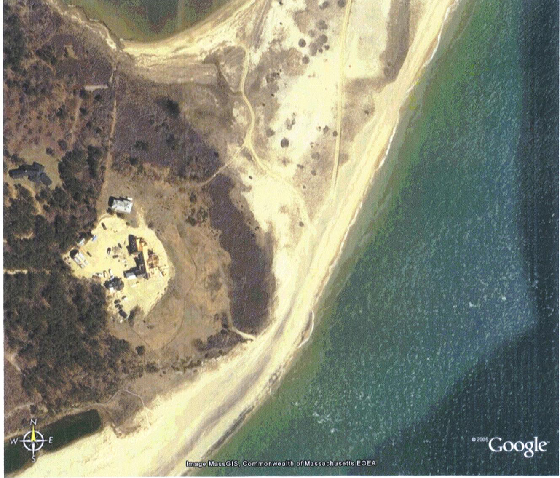 You can also use Google Earth to see fishing places that you have heard or read about. Google Earth is fun to use, and it can be very helpful. 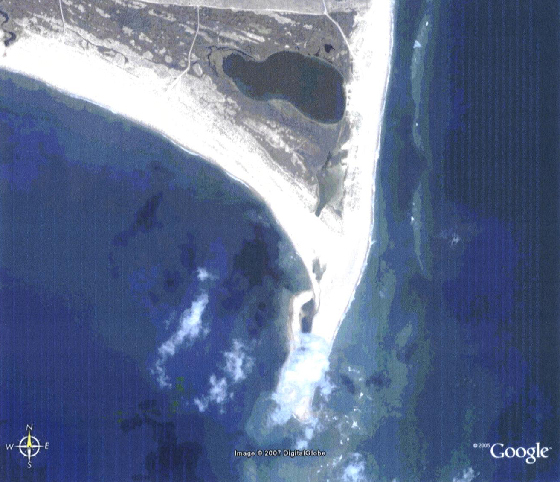 Google Earth Example - Cape Hatteras, NC as seen from space. The above picture shows a close up of "The Point" at Cape Hatteras, a noted spot to fish for many saltwater species including striped bass during the winter months. The picture is from Google Earth. Using Google Earth you can enter a location and zoom right in on the location as would be seen from a satellite in space. 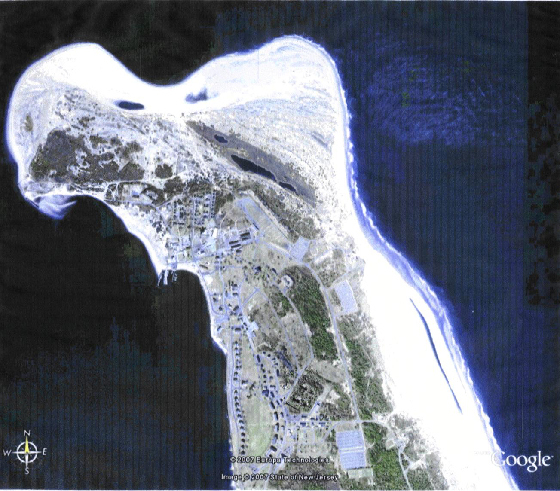 The Google Earth tool can be used by fishermen to perform reconnaissance of potential striped bass fishing locations, such as Cape Hatteras. Not only can you see the potential fishing spot, you can see the roads going there and where to park. You can also identify entrances to the beach for your beach buggy. The following paragraphs explain how to access and use Google Earth, including how to use the controls to zoom into a spot of interest, and how to use the directional controls to center the spot of interest on your screen. Note: Google is always changing and changing upgrading Google Earth. New versions with new features, and often changes to the controls, are often issued. The display example shown below may not be the most recent. Don't be concerned. Fool around with a new version and it's controls. It is usually very intuitive, you can become skillfull in using it quite quickly. After downloading, click the marble and run Google Earth. The Google Earth Display. 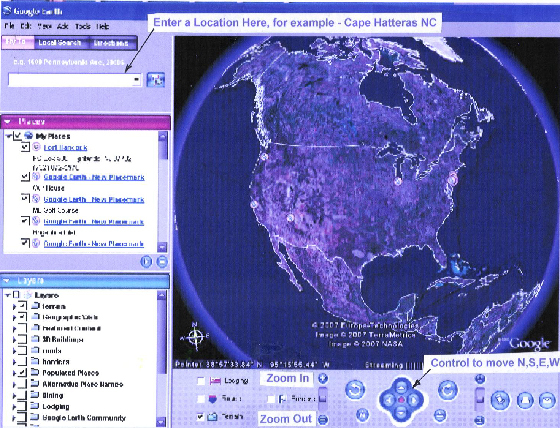 This versions of Google Earth has the zoom and centering controls in the upper right- hand corner. A recent version of Google Earth showed no zoom or centering controls, I clicked on "View in Google Maps" on th upper navigation bar and I got a view that did have the controls. They worked fine. 1. The Location Box - where you want to go. 2. The Zoom Controls (+ and - ) - to Zoom In and Zoom Out. 3. The Centering Controls (N, S, E, W arrow cluster) - to center the spot of interest on the screen as you zoom in. Type a location in the location box and hit enter. Google Earth will zoom in close to the location you typed. Now, using your mouse pointer, you can use the controls to zoom in closer. As you zoom in, some portions of the picture will move off your screen. Stop and re-center using the arrow cluster so that the area or spot you are interested in is centered on you screen. This is an iterative process. Zoom a little, re-center, zoom some more, re-center etc., until you are in as close as you want. You will also see some circles with letters in them. These mark locations of places like motels, schools, and places Google thinks you might be interested in. Some of these might be helpful, but they clutter up the picture and may mask items of interest. You can remove them. Below the location box you will see a list of these places with the same lettered circles in front of them. There is also a check box in front of them. Click and remove the check in the box. The circle on the picture will go away. Well now you are started, play around and have fun. You can scan along the shore and look for deep spots, cuts and things. But be aware; these pictures are not real time. If storms have occurred since the pictures were taken, the beach may look quite different. But it is fun to do. You might find something useful. 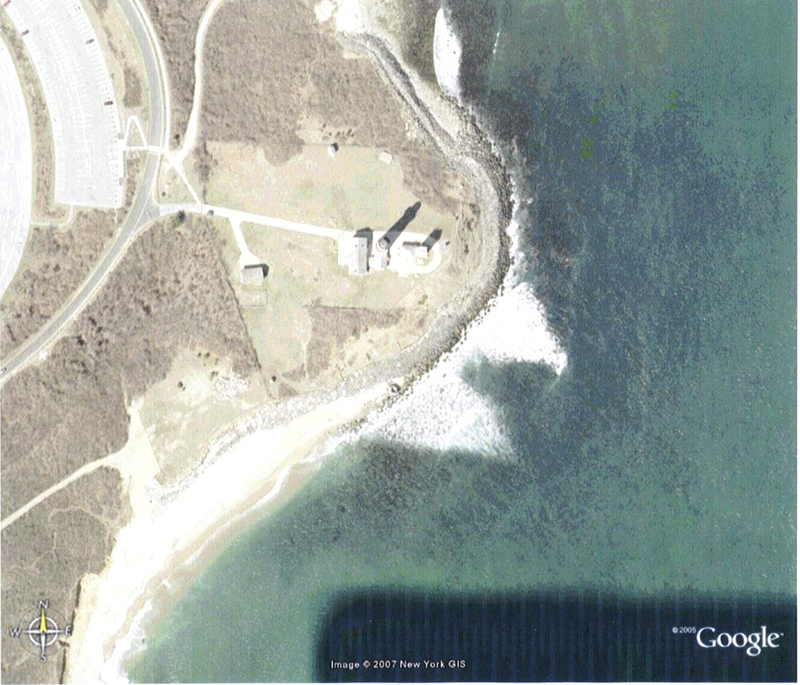 Some additional examples of the use of Google Earth to observe striped bass fishing spots are shown below.